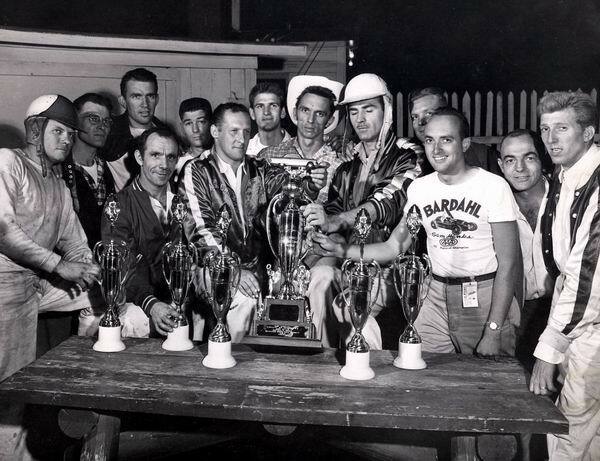 In that photo from Randy 100 lapper fairgrounds 1954, I can identify all but two of the drivers. I don't know the second one in from the left or the second one in from the right. Does any one know who these drivers are? Also in the race that was run in 1955 it was a 250 lapper and was won by Mason Bright. He drove a 1955 Chevy #96. Thanks, my email is stevew32@att. Also I saw a reference to Roger Meiners. My dad knew a racer by the name of Paul Mieners. Does anyone know if he was a relation? Thanks. When I was a kid maybe 1955-1959 we lived just east of the fairgrounds on the other side of the railroad tracks that ran along the east side of the racetrack. My dad and his friends would come over to the house, drink beer and cross the tracks and stand on the metal fence ran along the track and railroad tracks. They would come back to the house with blacken faces and tails of the races. Crazy dangerous and the cops would chase them off every so often but they loved it. I was just a little guy and so were my friends. None of the dads would allow the kids to go with them. So they had some sense! Anyone else remember that? PLUS my mom worked the concessions under the grandstands. 4/10/2009 - John Miceli I have a Gameday Program from the 1951 250 Mile NASCAR race at the Michigan State Fairgrounds. It is in perfect condition. If you are interested in this item contact me at jamlg250@gmail. com. Can anyone identity these cars and drivers. 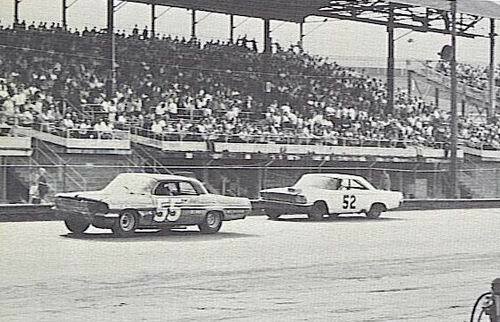 Michigan State Fairgrounds 1960. 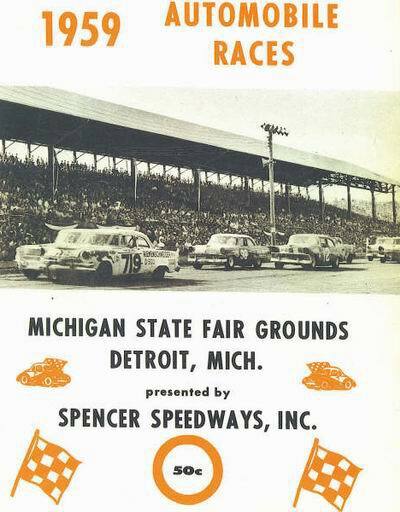 I have a Gameday Program from the 1951 250 Mile NASCAR race at the Michigan State Fairgrounds. It is in perfect condition. If you are interested in this item contact me at giovani@bellsouth. net. Mike Bellaire;I believe the driver you are describing, who led much of the race in a Chrysler, was Jack Goodwin. Jack is a well-known and successful local driver, (now retired in Florida) who raced Hardtops, Roadsters, Modifieds, late Models, and entered several NASCAR Races down south. If I have my facts straight, Jack was driving a Chrysler from Snethkamp Chrysler-Plymouth in Detroit, and was involved in an accident which punctured the radiator. The lengthy pit stop to replace it dropped Jack well back in the field. 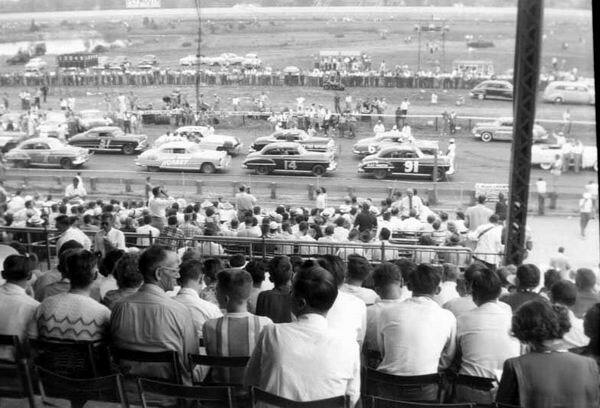 (I was at the 1953 and 1955 race, but not the 1954 race. I remember hearing the story) Dave Lyall, Livonia, MI. Pat:Your are correct about Ol'' Bee Bee Eyes Felix being flagged the winner at the Fairgrounds Stock Car Race, only to be moved back on a lap recount. However, the year was 1953, not 1954. 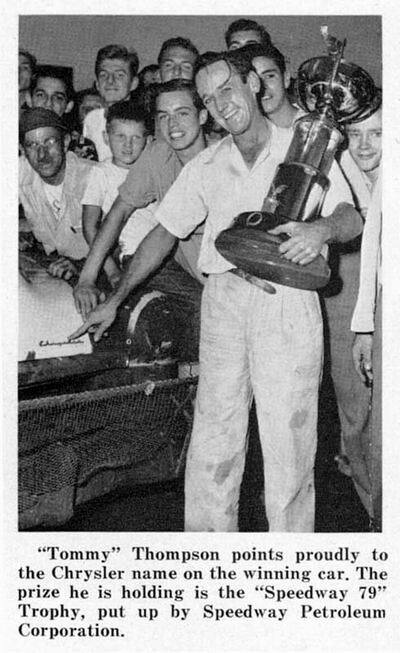 The eventual winner was Paul Goldsmith (who at the time was a seasoned motorcycle racer) driving a 1949 Ford owned by his friend, local hardtop owner and mechanic, Cliff Sommers. (Father of Artie Sommers) Felix, one of many local drivers entered was driving a 1953 Olds 88. 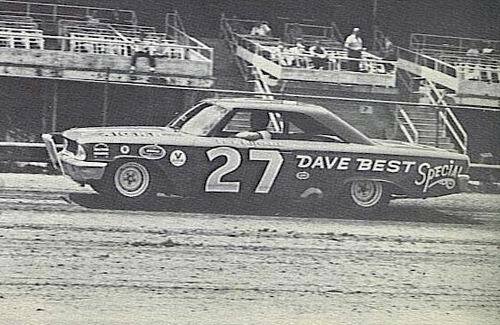 (Either owned by himself or Herb Pranger) When the green flag dropped, Bob Sampson, another well-known local (driving a 1953 Red Ram Hemi Dodge sponsored by Hodges Dodges) ran off and hid from the rest of the field, having almost a 1/4 lap lead by 20 laps. 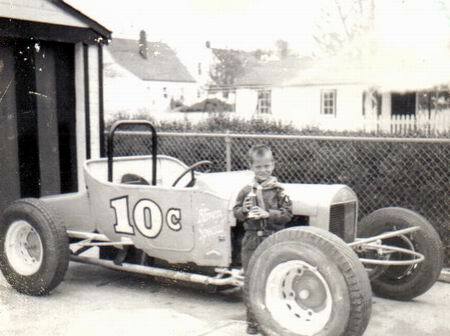 However, Bob, (usually in Hard Topsâ€, Sprints or Modifieds) was not a savvy stock car driver used to pacing himself and saving his equipment for the end, and literally ran the wheels off the Dodge, finally collapsing the front end on the rough and rutted Detroit Dirt Track and rolled the car. 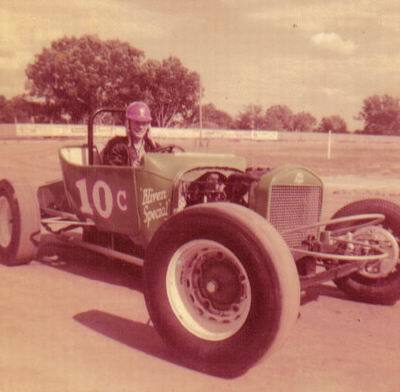 The older Ford Paul Goldsmith was driving was not as fast as some, but won the race by Paulâ€™s steady driving, saving his equipment, gas and tires, making less pit stops. Dave Lyall, Livonia, MI. 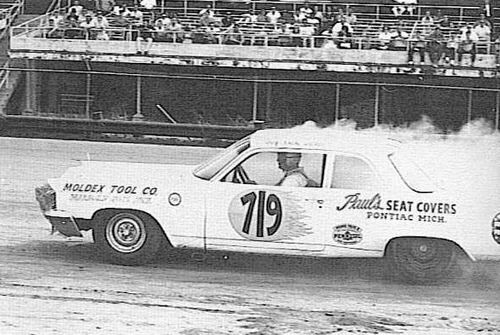 Wasn''t Felix Brooks the driver , at the fairgrounds in 1954 that was disqualified over an incorrect lap count ?Pat :L in Ypsi at patthehandyman1-hrs@yahoo. com. 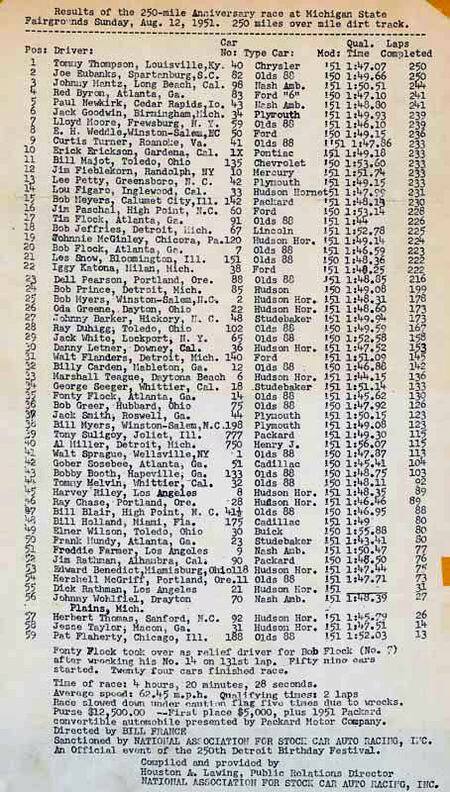 I''m looking for some rather obscure info about the Michigan State Fairgrounds race that was held on 9-12-54. Hershel White won the race in an Olds but much of the race was led by a driver in a 4-door Chrysler. Anybody Know who that was?????. Attended the races at the Michigan State Fairgrounds each year it was open. Enjoyed watching the annual ARCA sanctioned Labor Day 250 lapper on the big one-mile with drivers such as Iggy Katona, Jack Bowsher, Jack Goodwin,Les Snow, Joy Fair, Dudley Stacey ETC. The racing was outstanding back then. And with the State Fair as a backdrop it made for an exciting weekend of racing. Also saw the sprint cars at the fairgrounds on one occasion with the legendary Gordon Wooley from Waco Texas capturing the 100 lap main event. It surely was an exciting era in Michigan motorsports history. GEORGE OLDNALL. back when the Neederlanders wanted to put racing back here, I think that was the best shot and they did not win. They had all the planning, brought a few of the cars out to actually start ''em up for noise levels, they had the Novi Motorsports hall of Fame involved for a museum on the grounds and still a no go. It WOULD make perfect sense, but I do not see this ever happening due to the politics involved and the neighborhood. they are truly missing out on a very good revenue stream. it was worth a shot there Sean. I submitted a question to the State Fair folks and got this response. I don''t think people understand just how little negative impact a track would have and how many positives it could bring. What about Romulus? 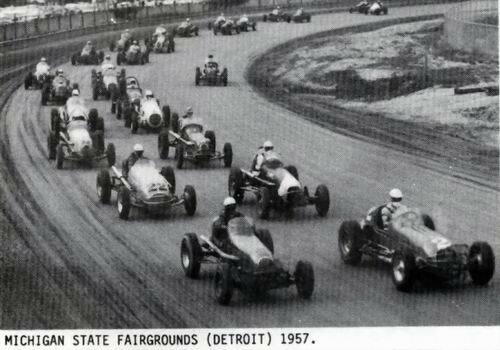 Every effort to bring back auto racing to the Michigan State Fairgrounds has been rejected and strongly opposed by surrounding neighborhood community groups and local elected officials. There are no future plans for racing at the Fairgrounds. Rosemary J.
Rosemary Peralta Michigan State Fair & Exposition Ctr. Nice new photos but a few of them look like they are Backwards?. The cars are going clockwise and the drivers are in the British way, (right hand side). A scanning error, or negatives??? Great shots none the less. Races were held in the Coliseum at least twice that I know of. The Michigan Legends raced there in the 90's with Tom Terzo winning the feature and more recently in March of 2003. In 2003 it was the Legends cars, Midgets, TQ Midgets and Go-Karts along with these pocket rocket motorcycles. Mel Kenyon was there in the midgets. Mie Satkowiak won the Legends Cars feature over Billy Simmons. I won a heat race in my Legends car and finished 6th in the feature. That was Drew Simmons last race as He lost his life the following Monday in a snowmobile accident. Drew was 19 years old and lived in Tawas City. While the event was run indoors, the weather still had an effect on attendance as there was a batch of winter weather that made roads slippery due to snow and freezing rain which held the crowds down. Gene Clark lost an oil fitting during the Legends feature and oiled the track down pretty good. I can remember sitting in my car during the lengthy red flag for clean-up and hearing un-educated drunken fans yelling insults at the safety crew and the drivers. Kind of got to be frustrating but we all ignored it and once the green flag came back out we forgot about it. It was a tight little race track and it took it's toll in busted up equipment but it was still racing in March and how can you beat that?. never saw a race here, but I did see the Hurricane HellDrivers stunt show when I was a kid. It was ok but it wasn't a race and I remember being a little disappointed. This is probably why I don't enjoy all the side show stuff tracks do today like boat trailer bus outhouse faster preacher wheel barrow pseudo race things. I drive by this place all the time and wish i could go back in time or that there was still a track here. Once, when it was softball city, I actually drove to the end of the front stretch where the first turn would have started. It had to be one of the saddest feelings ever, knowing what was lost. 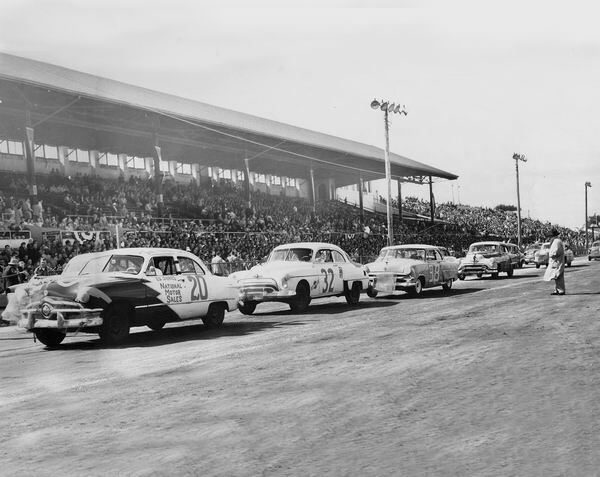 NASCAR ran two races at the Fairgrounds in 1951 and 1952. The city of Detroit celebrated its 250th anniversary by teaming up with NASCAR to promote the 1951 race, which was won by Tommy Thompson, of Louisville, Kentucky, in a 1951 Chrysler New Yorker. There was a lot of speculation leading up to the event that the track would not survive a 250 mile race. 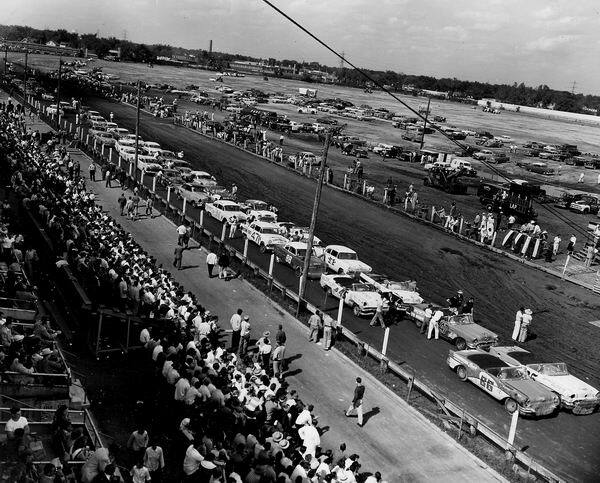 NASCAR wasn’t worried, though,having staged at least 100 dirt-track races since 1949. Thompson qualified third for the race. The great Marshall Teague qualified on the pole in his Hudson Hornet, but was disqualified and later reinstated in a big rules controversy over his new dual-carburetor setup. Teague rocketed away at the start but was challenged early by Sosabee and Tim Flock while the experienced Thompson watched and waited from his vantage point just behind the action. Teague had mechanical problems almost at once, letting Flock and Sosabee through before dropping out. Thompson and Flock then dueled for lap after lap, but Flock was victimized in a massive pile-up that took him out as well as damaging the Plymouth fastback of Lee Petty in a roll over. Petty finished the race without a windshield in his well-smashed car. Curtis Turner, the fun-loving and controversial NASCAR legend, then took his turn in the fight for the lead with Thompson. Their fender-to fender duel went on for over a hundred laps until Turner tried Thompson on the outside out of turn two. They came together and both crashed into the outside wall at the head of the backstretch. Both got going again, but Turner’s radiator was badly damaged. He chased Thompson for a lap or two in a cloud of steam before giving up. Thompson then took his battle-scarred New Yorker Hemi to the finish. On the last lap crew chief Bill Cantrell held up the pit board chalked with a large dollar sign. The $5,000 first prize was Thompson’s. Actually, that neighborhood isnt going to run its course anytime soon. I dont know if you ever been to Seven Mile and Woodward but the neighborhood west of Woodward and north of Seven Mile is probably the single wealthiest one in the city with some of the nicest and nicest kept homes anywhere in the metro Detroit area. True enough the area to the east is pretty wrecked but people that live there have the same concerns and the same rights as every other citizen and poverty is not an excuse to make people except something they dont want, even if in my opinion it would be a great thing for their neighborhood. Id love to have a track in my backyard! The people that live in all those homes as well as the surrounding suburbs of Ferndale and Pleasant Ridge are the reason the track is a no go. I spend lots of time in Detroit and Ferndale talking to people and I wanted the track too, but people that dont like racing and think its going to cause traffic and noise problems dont listen when they think their property values are going to suffer. You can say, its only a couple weekends a year and would do so much for the city, but they dont believe it or they wont listen. Just like when you say, Detroit isnt just one huge slum. People dont listen to that either. Many people assume that because its Detroit its just burnt out slums and while the city has way more than its share of decay, having lived there most of my childhood and most of my adult life I can assure you this is not the case. The place for big-time Stock Car Racing in Michigan, before MIS was the Michigan Fairgrounds Track. I attended many of these races, and they were sell-outs. Too bad the present locals cant see past thier own hood to get the big $ picture. Oh well, I think the State should just wait untill the neighborhood runs its course, and then reclaim the land and return the Michigan Fairgrounds Track back to its rightfull place amoung the greats, and back into income-generating real estate. 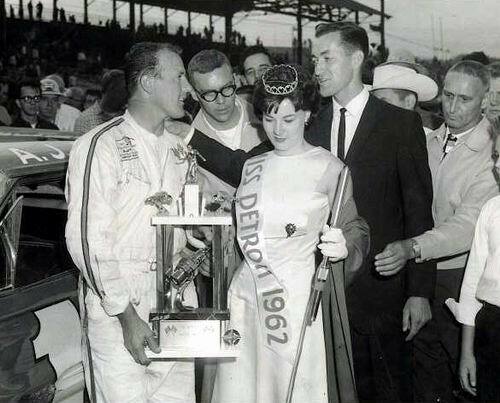 I remember the Grand National race that celebrated Detroits 250th celebration. Lee Petty rolled his Plymouth and his car looked like it had a peaked roof. There he sat with his white suit and that little helmet with all that track dirt in his face. He just kept on driving and didt have a bad finish. I remember going to the Michigan State Fair just for the races. It was a total dust fest, but the action was great. I do remember Iggy Katona, Jack Goodwin, Danny Byrd (in the 08 Edsel) and others racing the oval. Also, I do remember going there to see Joey Chitwoods Hurricane Hell drivers stunt show. That was always a crowd pleaser. 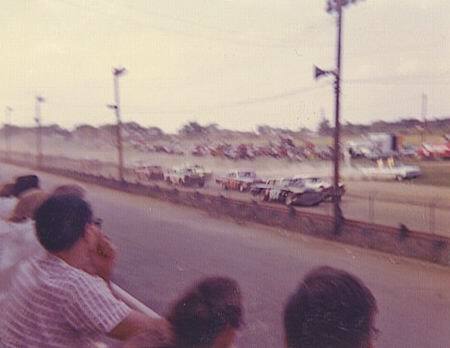 Of coarse as the track started to close, the front sretch was used for a few fair Demolition Derbys. I still think that would be a great place to bring back racing to the Motor City, since the automotive capital does not have ONE kind of race track in the surrounding area. oh wait, there is Flat Rock or Flint, if thats surrounding? 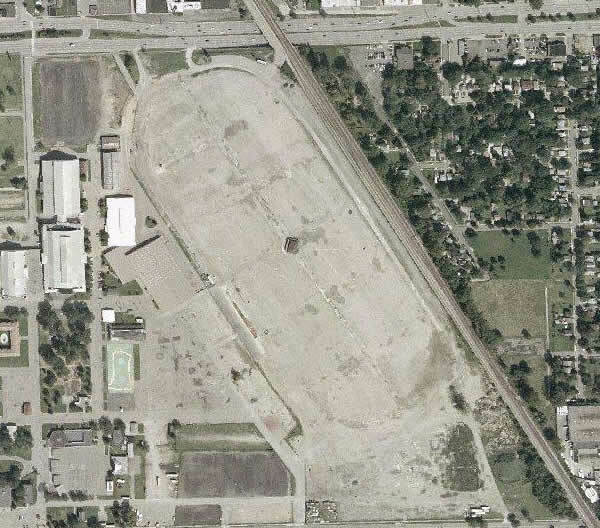 I vote yes to bring back a Motor City Speedway at the old fairgrounds. I know its beating a dead horse, but the squeeky wheel gets the oil. My dad used to take me to the Fair Grounds in the 40s to watch thorough-bred horse racing. 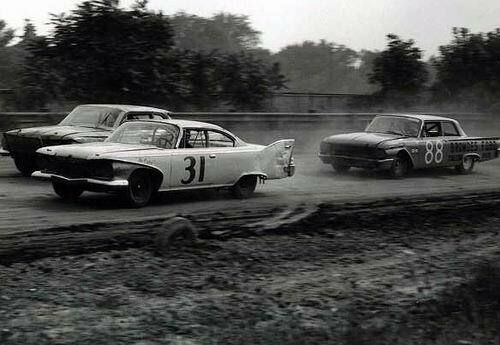 In 1950 and 51 Grand National Stock Cars(now known as NASCAR) raced on the track. Lee Petty,the Flock bros. and other big time drivers were there. A few of the drivers from Motor City also raced. Al Miller Iggy Katona Jack Goodwin ,to name a few. I attended both races. There were car racing of some type during the Mich. State fair run over the years before the track was closed for good. As of today, the old track section is used by Chrysler to store new cars.